Introduction: The number of weight loss procedures is rising rapidly, so that complications which were previously considered rare are not uncommon now. 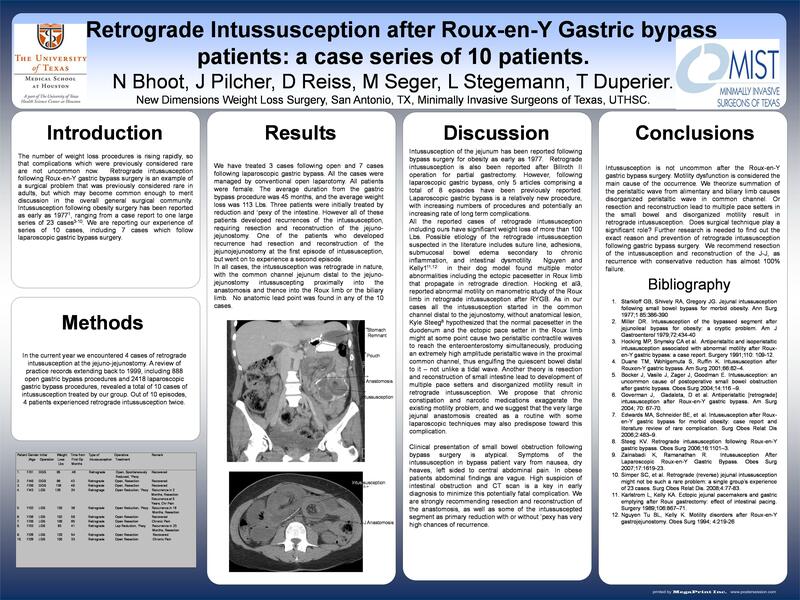 Retrograde intussusception following roux-en-y gastric bypass surgery is an example of a surgical problem that was previously considered rare in adults, but which may become common enough to merit discussion in the overall general surgical community. Material and methods: In one year we encountered 4 cases of retrograde intussusception at the jejuno-jejunostomy. A review of practice records extending back to 1999, revealed a total of 10 cases of intussusception treated by our group. Results: We have treated 3 cases following open and 7 cases following laparoscopic gastric bypass. All patients were female. The average duration from the gastric bypass procedure was 45 months, and the average weight loss was 113 Lbs. Three patients were initially treated by reduction and pexy – all of these developed recurrences of the intussusception, requiring resection and reconstruction of the jejunojejunostomy. In all cases, the intussusception was retrograde fashion and no identifiable lead point was found. Discussion: The underlying cause is not clear, but it seems there must be a combination of anatomic abnormality; an enlarged anastomosis which can accept the intussusceptum, and motility dysfunction to cause reversed or disordered peristalsis. Further research is needed to find out the exact reason and prevention of retrograde intussusception following gastric bypass surgery. We recommend resection of the jejuno-jejunostomy as well as any intestine that was damaged by the intussusception and reconstruction.